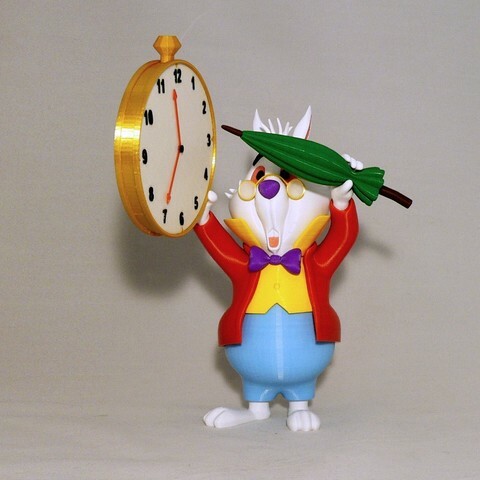 White Rabbit, a character from Lewis Carroll's Alice's Adventures in Wonderland. 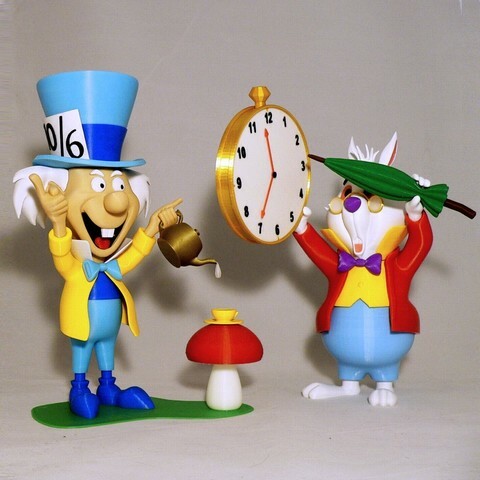 Alice first meets the White Rabbit at the very beginning of the story, while he is muttering "Oh dear! Oh dear! I shall be too late!" Alice then follows him down the rabbit hole into Wonderland. 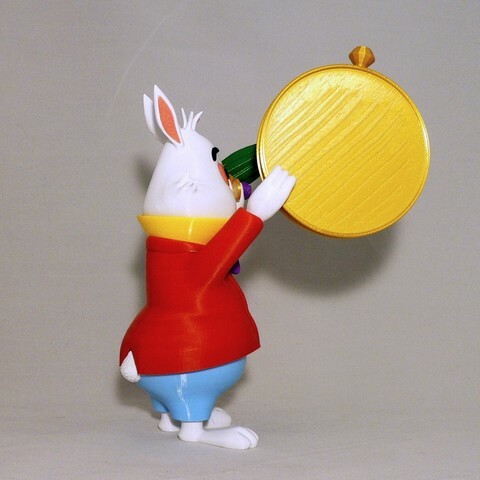 Enjoy, and don't get lost while going down the rabbit hole of 3D printing! 2-The tie_left and tie_right pieces should be printed with a brim. Oddly enough I also wound up using a brim for the shirt piece. Use your own judgement for some of the smaller pieces. 3-The parts should fit nicely when printed cleanly or with a slight first layer squish. A reminder, first layer cleanup also applies to the inside edges of parts. Holes for pins that are on the print surface should be clean of first layer squish. 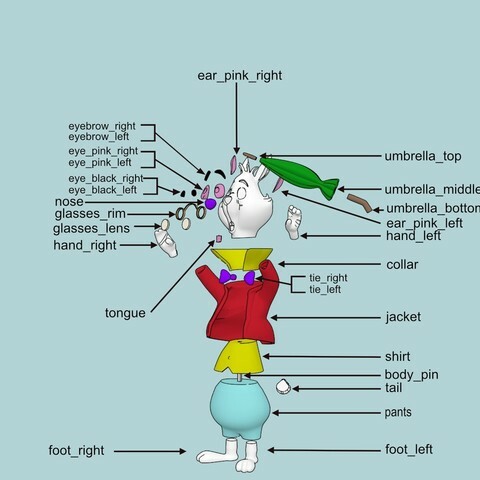 Parts such as the collar and shirt have edges that are on the inside of the model that also need to be clean for a good fit. -I print in both ABS and PLA and use filaments from almost any company that has the color I need, including sample packs and filament sold for 3D printing pens. 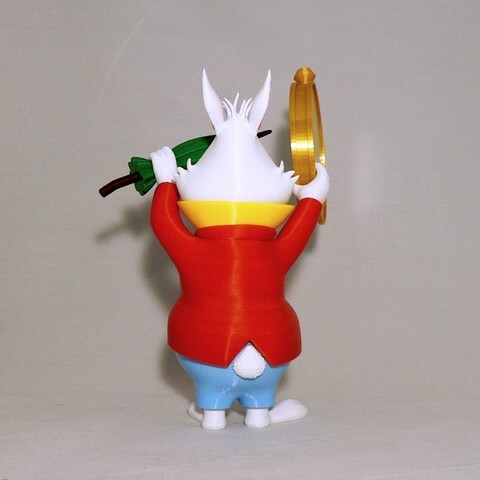 That said, for white color I found that eSun ABS filament is quite different than any other white that I've used. It is a much richer and denser color and prints a bit thicker than my other filaments. For me, the eSun white made the difference in this model. After all, it is the WHITE rabbit! -My wife insisted on a shiny gold for the watch and she found "3D Printer Filament PLA 1.75 mm Silk Gold" on Amazon, by CC3D. It's a stunning filament. Once again, always listen to the wife! 1-Be sure to put the jacket over the shirt/pants before putting the collar and head on. If there are any fitting issues it would most likely be due the first layer squish in the hidden areas. 2-The proper fit of the head and collar may seem a little odd when you put them on, do not be concerned. 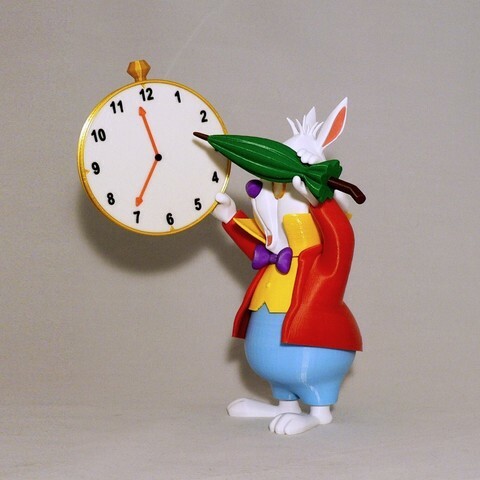 The White Rabbit has his head and collar turned a bit looking at the clock. Once the tie is in place it all flows properly. 3-As with all my models, I print the text upside down. When the numbers are inserted to the clock, the side that was on the printer bed faces out. This ensures a cleaner fit. 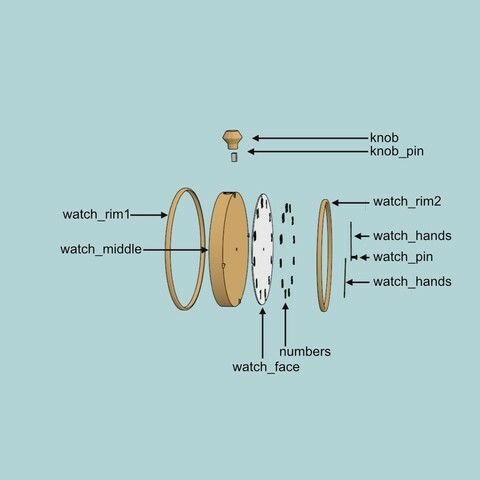 4-**Important: Be sure to align the watch_face to the watch_middle with the number 12 by the hole for the knob. 5-The hand_left is formed to fit the watch, however since the watch is round the hand could be placed anywhere along the rim. Manually place the hand near the four so that when the hand is inserted into the jacket, the clock knob is pointing roughly up. 6-Refer to the assembly diagram as well as the uploaded pictures for putting the model together. The model is meant to be glued.